So, I just spent two days walking, and paddling, from Byron Bay to the Gold Coast – well Fingal, actually, just over the border in Northern NSW. I was fortunate enough to be invited along with a group of Indigenous dad’s and their sons on the walk, following the story line of the sea eagle, and introducing the youngsters to their indigenous culture. It’s hard to put into words what a rich, profound experience this was – like a parallel universe, glimpsing our country as it once was before European settlement and getting a real understanding of the nature of Indigenous Australians’ connection to country. We set off from Fingal around 4 am to drive to Cape Byron for sunrise, where a short ceremony was held. Our leader Kyle Slabb lit a fire, as is the custom, and waited for a local Arakwal fella named Nigel to come and welcome us onto his land. Foreheads were smeared with a streak of ochre and we all had to walk through the smoke to cleanse us and bless us for the journey ahead. We walked 16 km up the beach from Byron to Brunswick Heads in about three hours before the heat of the day set in, then paddled from Brunswick to New Brighton in kayaks that were transported for us by Kyle’s brother Joel in a support vehicle. 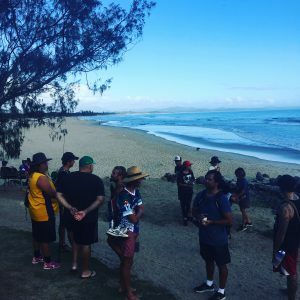 We camped overnight under the stars at New Brighton, where the boys were taught the dance of the Sea Eagle and the Stingray and introduced to some of the basic principles of mutual obligation that govern family relationships in Indigenous culture. Seeing my little blond boy dancing along with his new Indigenous mates rates as one of the high points of my fathering days. There was a bit of jamming on didg and guitar before settling into sleeping bags and then a surprise good night serenade from one of our fellow walkers, musician Xavier Rudd. It was up with the birds the next morning and a walk through the bush to Woyong, where we again boarded the kayaks and paddled to Pottsville. From there it was an easy walk up the beach to Hastings Point and then a detour inland through an amazing heath of grass trees and paperbark forest before the jolt of hitting suburbia out the back of Cabarita. It was an odd experience walking through suburban streets after a day in the bush and the beach but the brick veneer houses and bitumen soon gave way to the wide expanses of Cabarita Lake where we paddled and sometimes dragged our kayaks through thick reeds before emerging into a delightful meandering creek that took us to Kingscliff. This was probably the most challenging section of the trip, paddling against the tide so it was a relief to again hit civilisation in Kingscluff, grab some sustenance and re-group for the final beach walk to Fingal. The lighthouse guided us home as the sun set and we finally got into Fingal around 8 pm, tired, sore but fundamentally altered by the experience. I feel like I see the world around me through fresh eyes and now understand first hand what it means to keep culture alive and truly get to know the land we inhabit. To hear Bundjalung language spoken and to see young kids inducted into their cultural ways, despite more than 200 years of oppression, is hugely inspiring. Deep gratitude to Kyle Slabb and his family and all the support crew and fellow walkers for a memorable experience that will stay with my son and I for all our days. Reconciliation is not just a feelgood project for small l liberals to assuage white guilt, but a national project to ensure a healthy, safe, sustainable and cohesive future for all of us. There is so much to learn and the journey is only just beginning. The generation of Indigenous leaders like Kyle deserve all our respect and gratitude for the invaluable work they do. The next day I woke aching all over and wanting only to rest and hide from the sun. Before long I’d received a text from Kyle saying they were going to keep going from Fingal to Burleigh to complete the journey between the four key bora rings in this region. I had to make my apologies and respect my body’s need to rest and was stunned the Fingal crew could keep going. The urge to walk this land is so deeply embedded in their DNA and they see it as a symbiotic relationship with country, that the land needs to be walked over, is crying out for our company, our time and attention, to look and listen and feel its condition. We’ll have reached maturity as a nation when we all begin to feel this urge. Thanks Nev, I love the way you go out and try and make the world a better place!